I have a lot of time in between coats of Tung oil so I got a head start on making some of the accessories Josh will need for the bow. 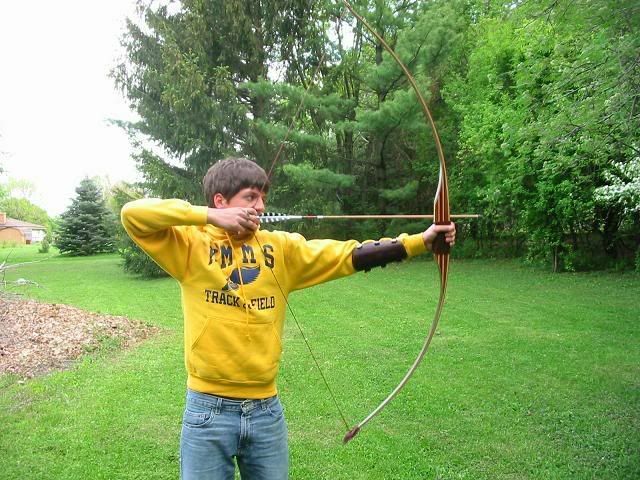 The first thing he needs is a bow stringer. I took an old bungee cord that I had removed the hooks from because I needed them for some other project and I cut off one end. 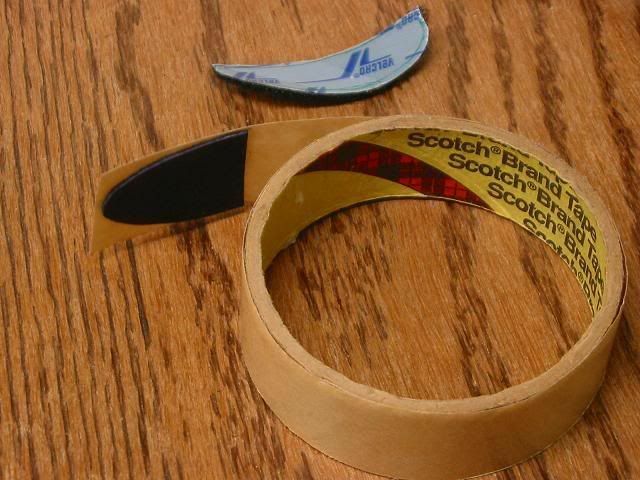 Then I trimmed off one side to create a flat surface. 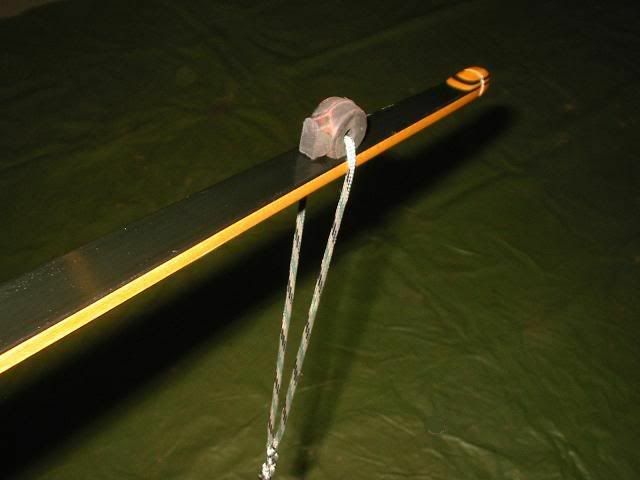 The flat is the surface that will contact the bow limb when being used. It took two cuts to get it where I wanted it. The other end of the stringer will slip over the limb. 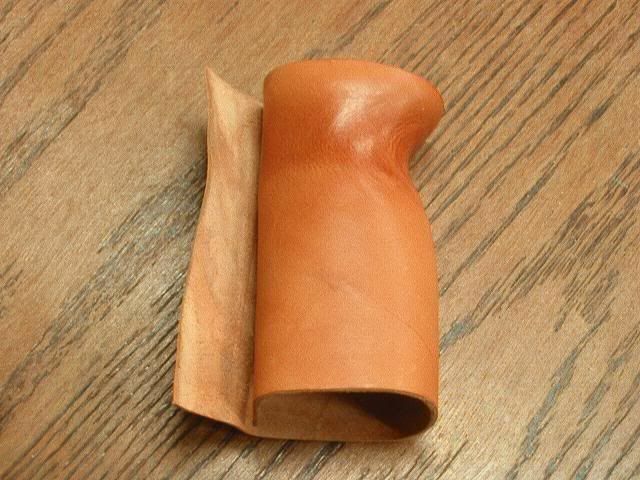 This part, I made out of a piece of scrap leather. 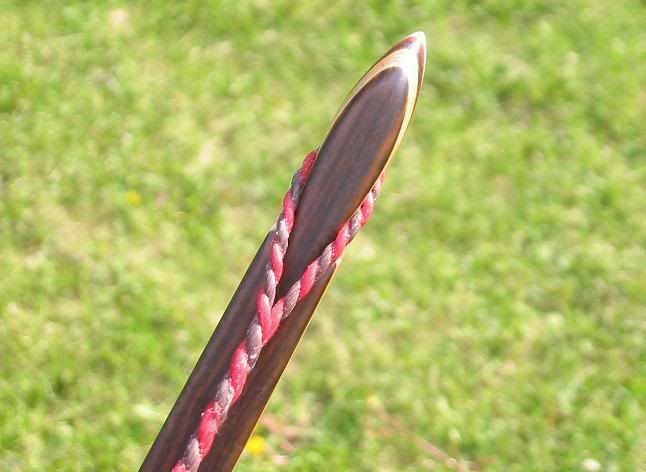 Then sewed it using white, braided, waxed line. 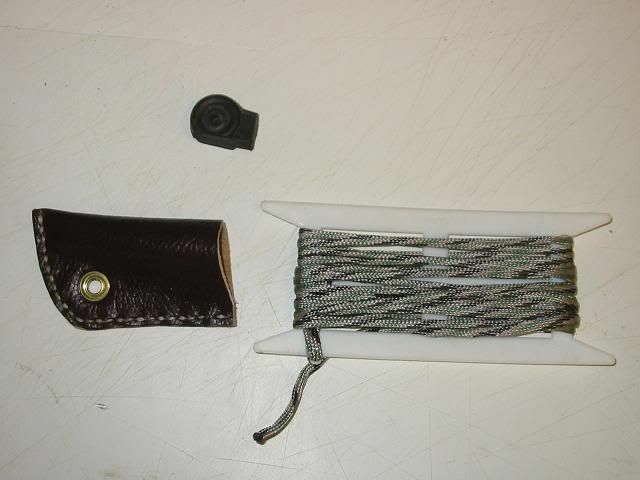 Then I added a grommet for the rope to attach to. 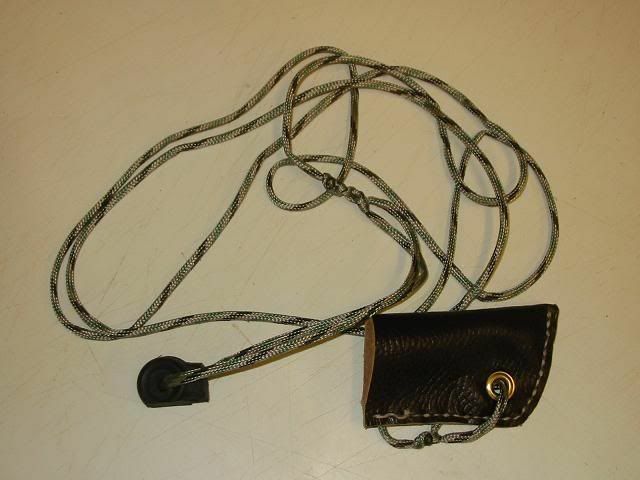 Both ends were then connected using a strong nylon rope. 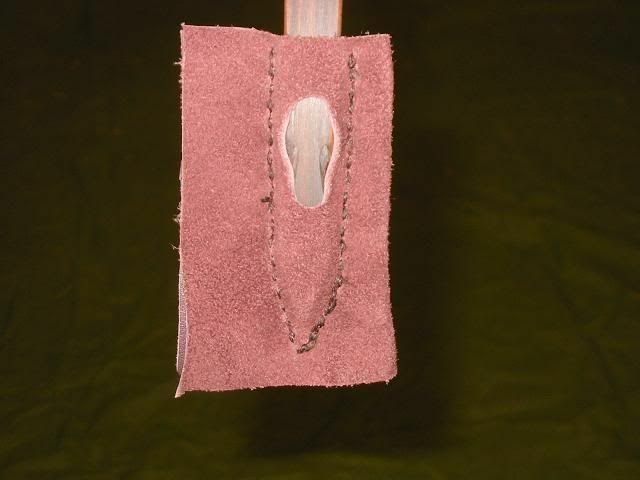 To use the string, On end is slipped over the lower limb tip. 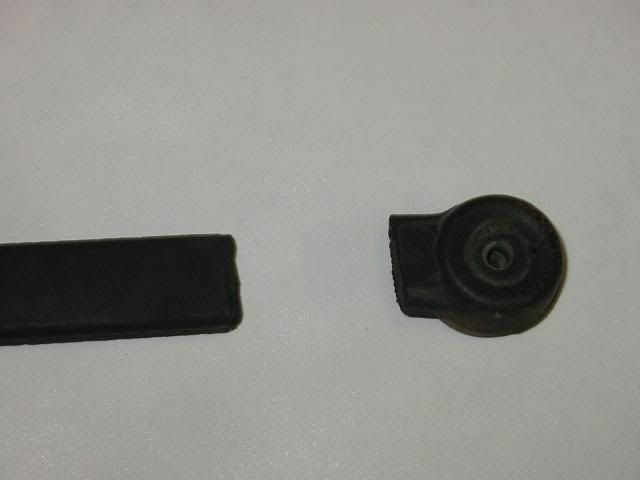 And the rubber end is placed on the upper side of the other limb. 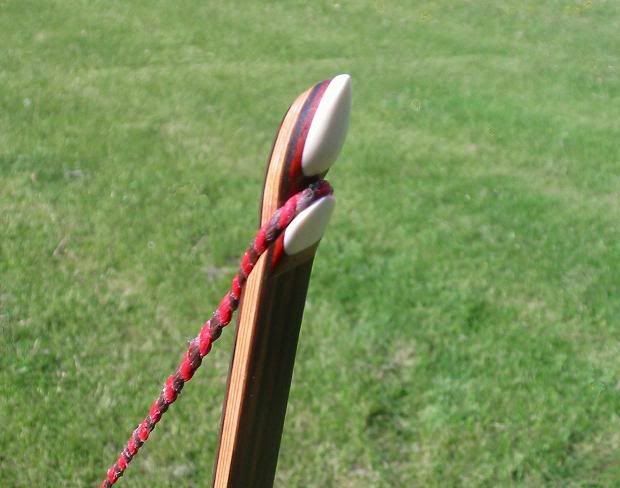 The knot is tied far away from the rubber end to allow for clearance for the bow string to pass through. 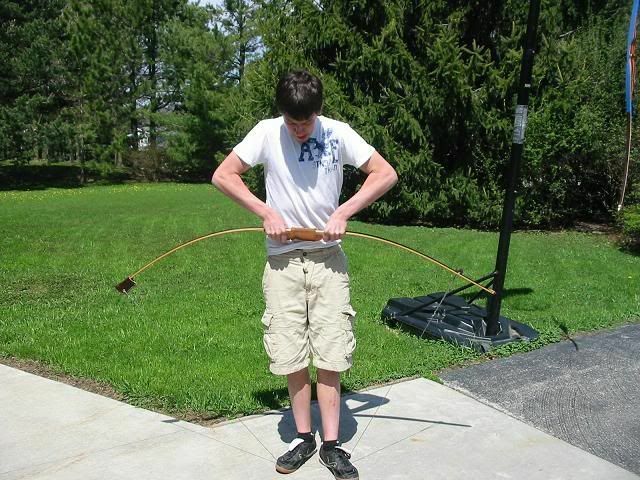 I had Josh try it out on my old longbow since the Tung oil was still wet on his. 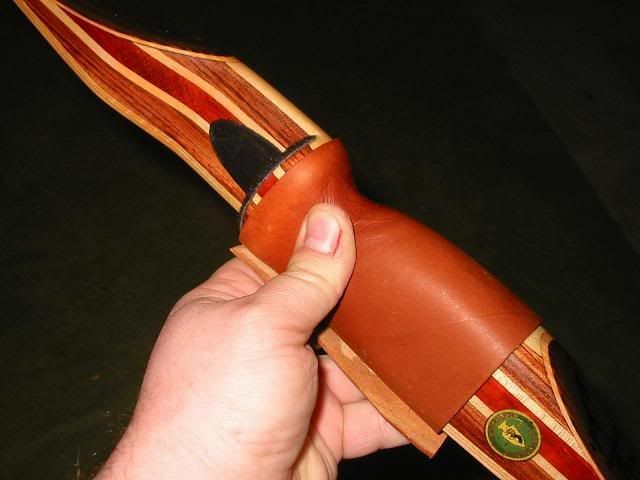 One hand lifts the bow and the other hand slides the loop of the bow string into the string groove on the limb tip. 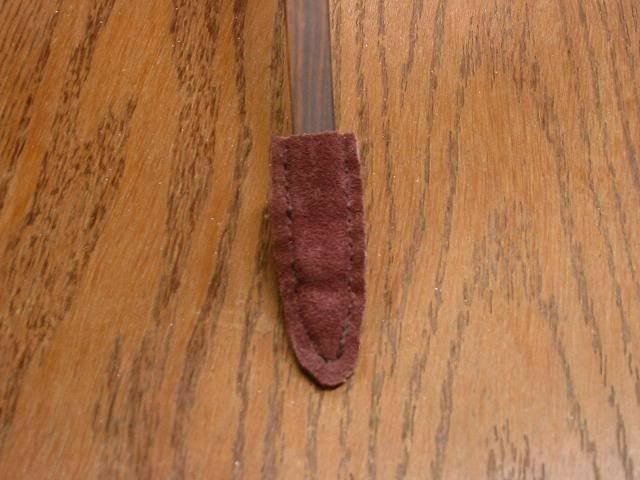 With the string finished, I moved on to a limb tip protector so that nice white antler limb tip won't become damaged when he sets the tip in the dirt. 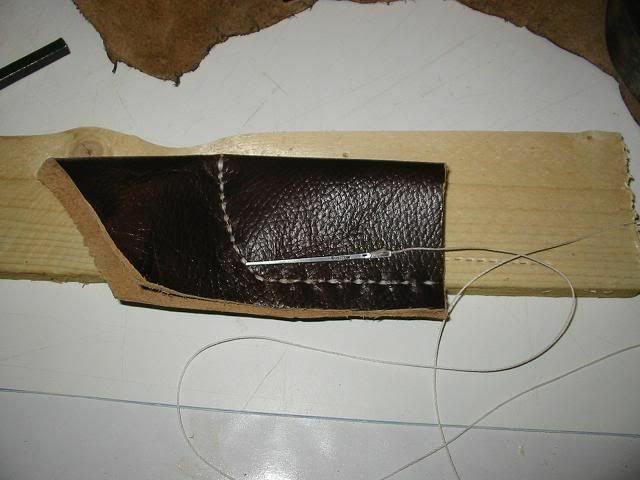 I started with two thin pieces of suede leather and stitched them together to make a nice tight fit over the limb tip. 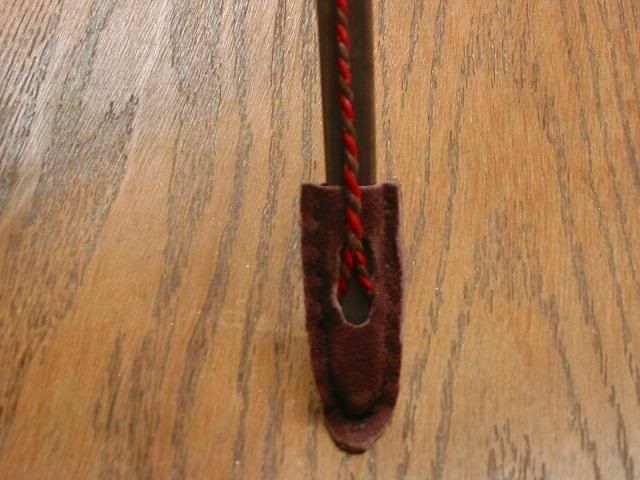 I then cut a long slot in the back side for the bow string to pass through. It is a tight fit and that will keep it from falling off. 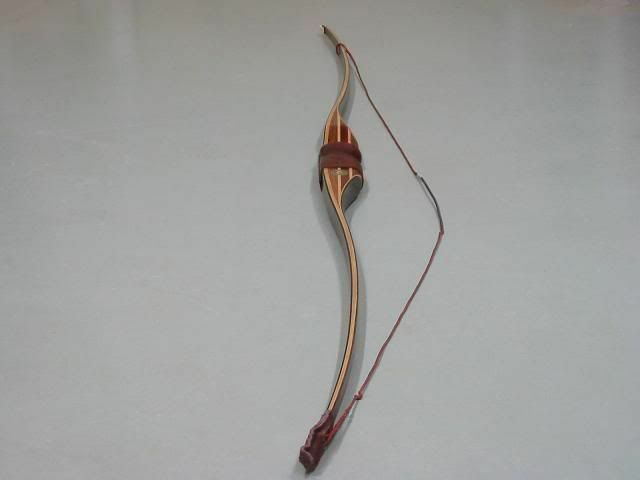 I then trimmed away the extra leather around the outside and tried it with the bow string in place. 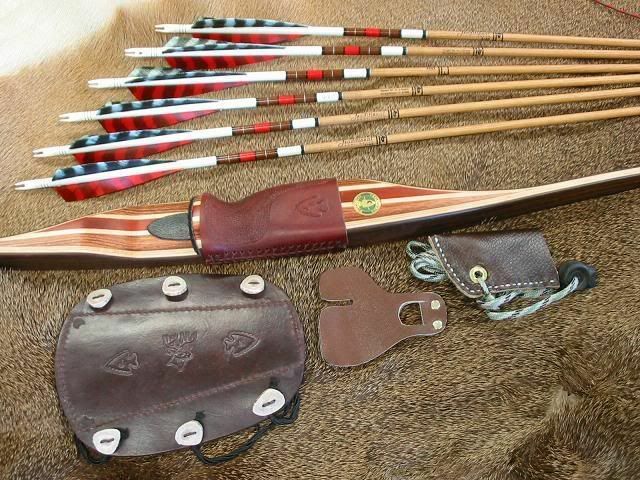 I still need to make a string keeper, an arm guard, a finger tab and a case for the bow as well as a set of arrows. The joy is in the planing and doing. Giving each coat of finish a long dry time still leaves time to work on other parts of the project. 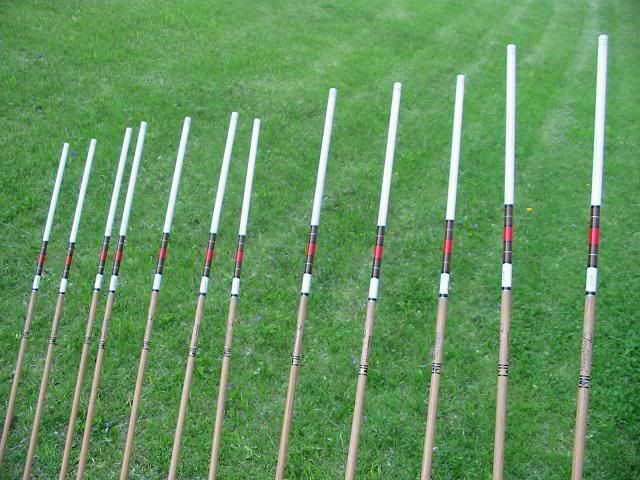 I received the shafts in the mail so I can now start the arrows for the bow. 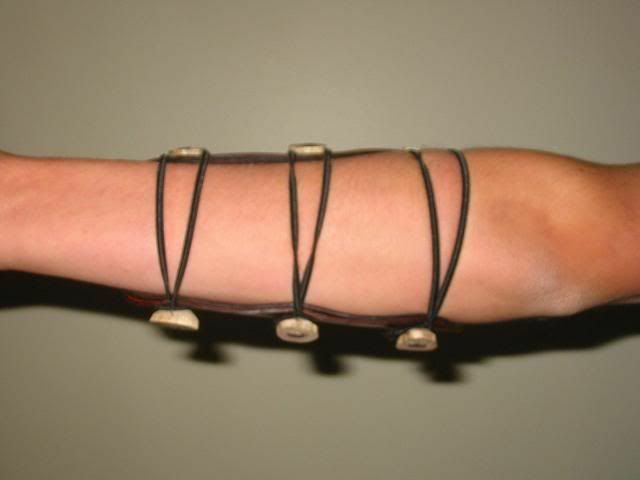 In the mean time, I had a little time to make Josh an arm guard to go with the new bow. I used 5 Oz. 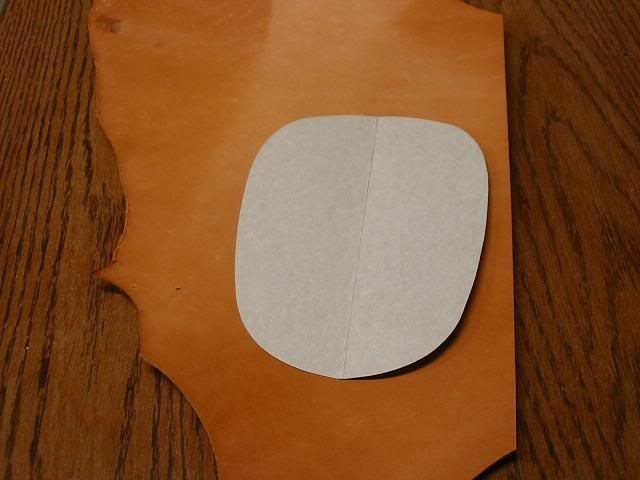 tooling leather for the face and 4 Oz. 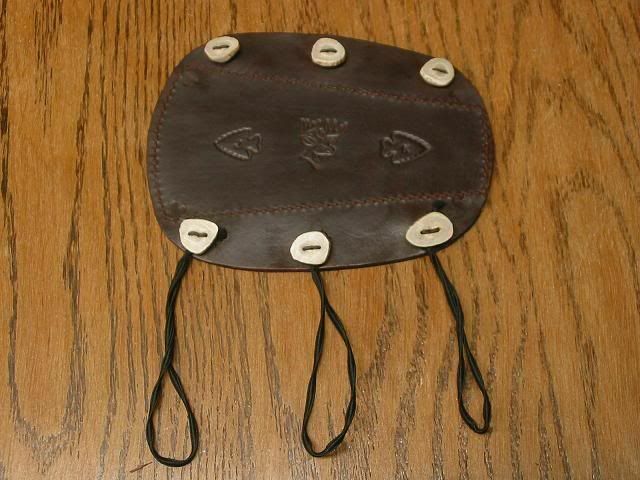 Buffalo for the backer. I added a little tooling with his initials. 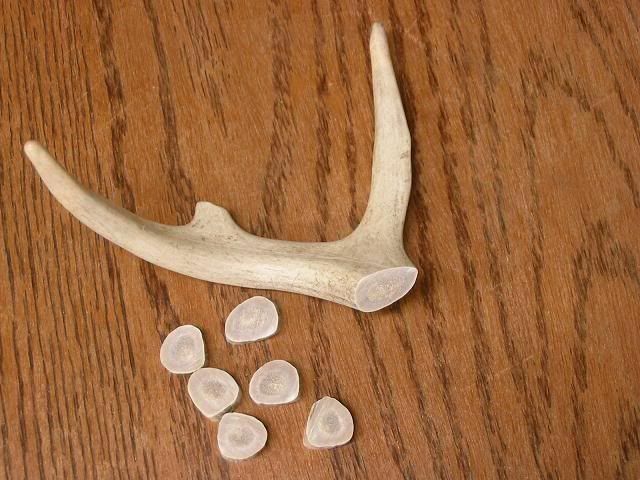 And made some antler buttons. 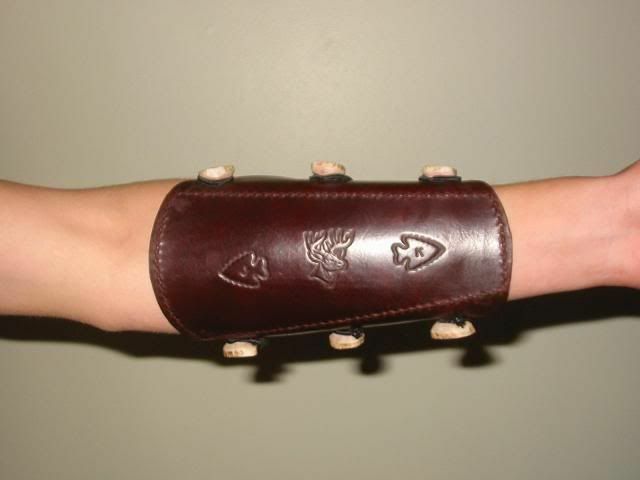 In the spirit of this homemade bow project, I wanted to make josh a finger tab to go with the arm guard. 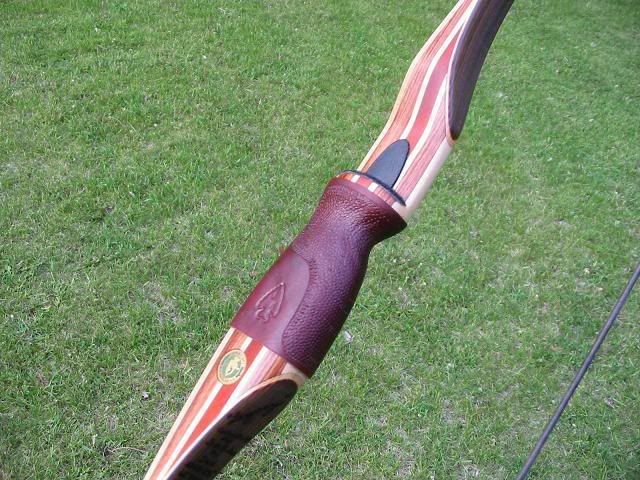 At some point I will need to make a quiver as well. 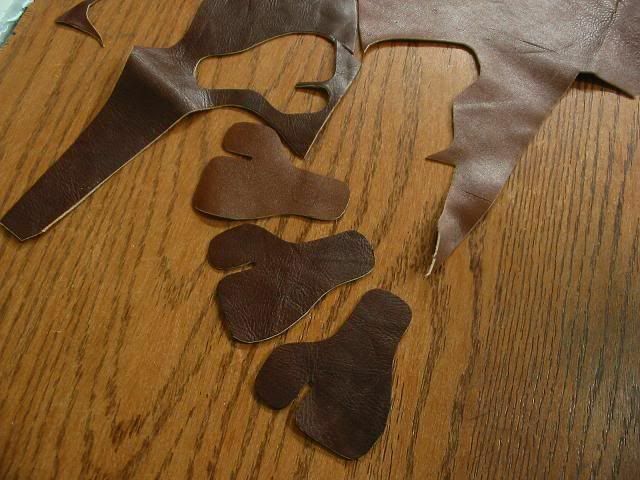 I traced the shape of my homemade finger tab for Josh's and cut out 3 of them from some medium thickness scrap leather. I then stacked the 3 and used brass rivets to hold them together. 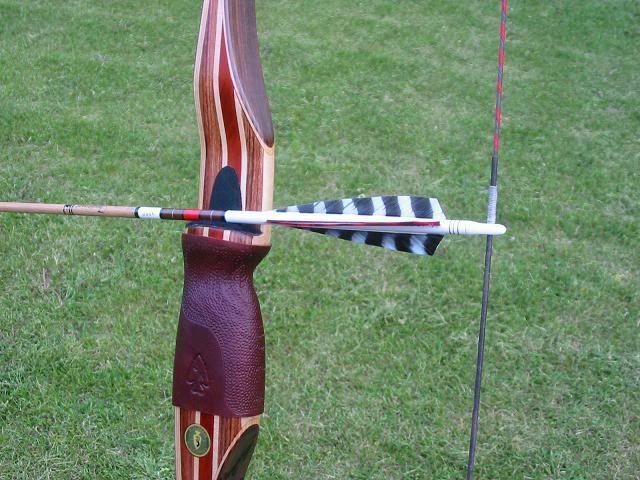 I then began to focus on the arrows for Josh's new bow. I got the shafts from a local suppliers. 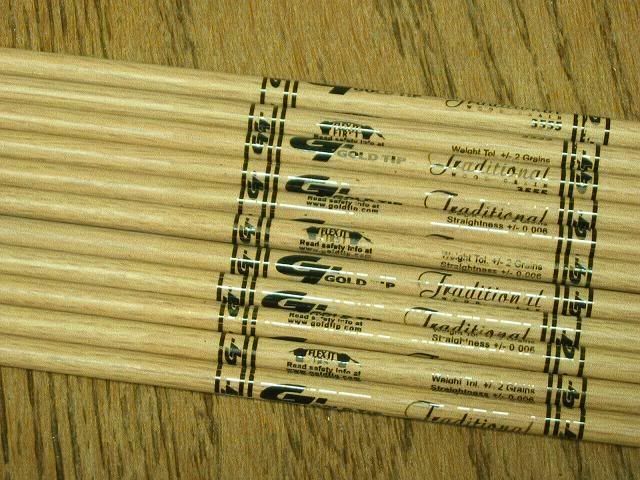 I bought Gold Tip Traditionals because of the wood grain look. After capping the back 9 inches of the shafts with white lacquer, I started cresting the shafts using a color scheme that resembles the riser. 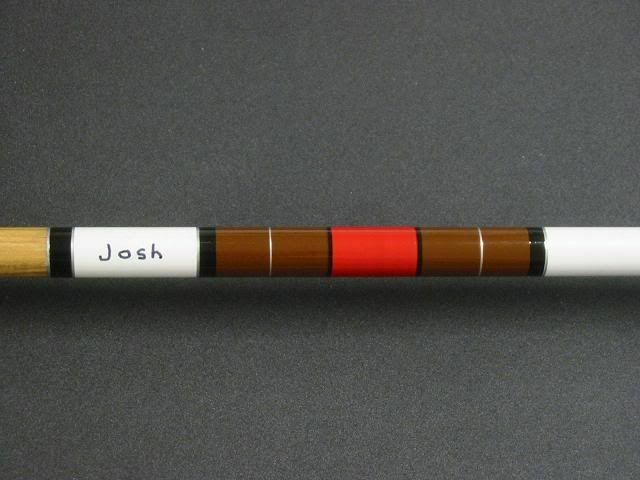 I will write Josh's name on all the shafts. 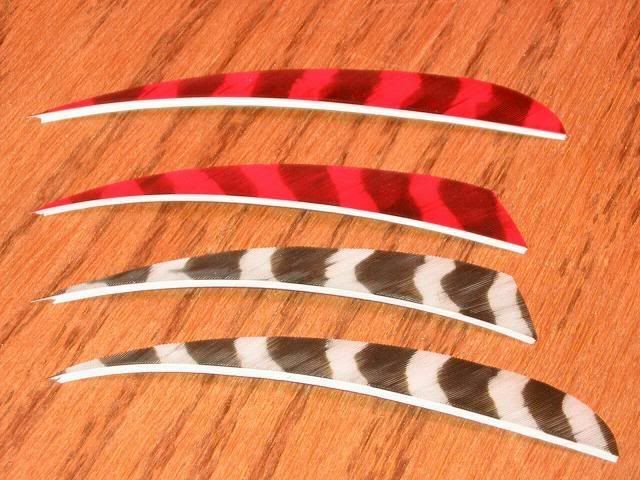 The fletching will be 4 1/2 inch long LW barred turkey feathers. 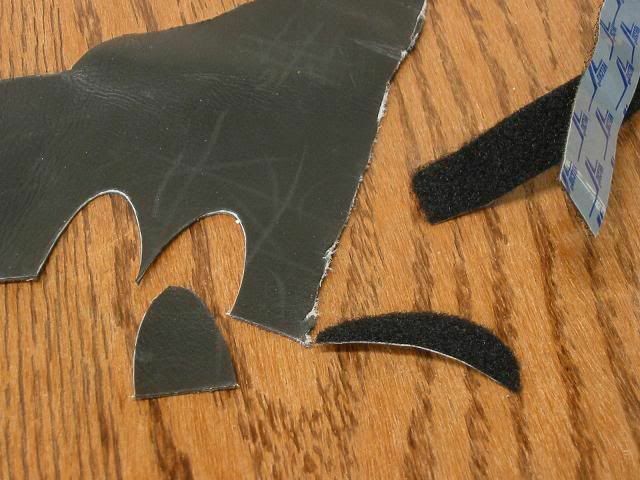 Since nobody sells 4 1/2 feathers, I bought 5 inch parabolic cut and converted them to 4 1/2 shield cut. One down, 11 more to go. Were in the home stretch now. 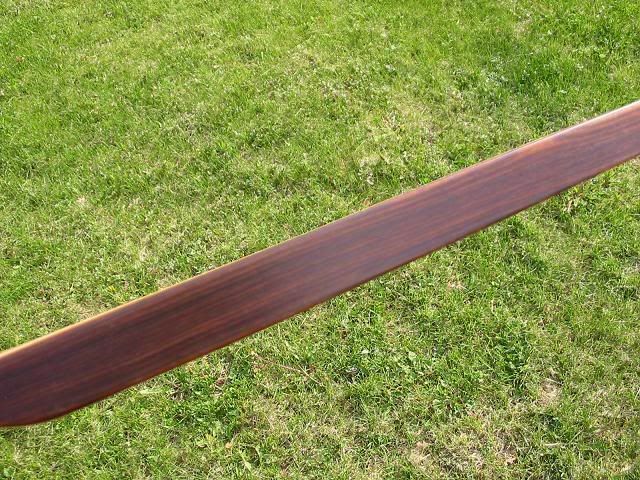 The finish on the bow is now hardened. 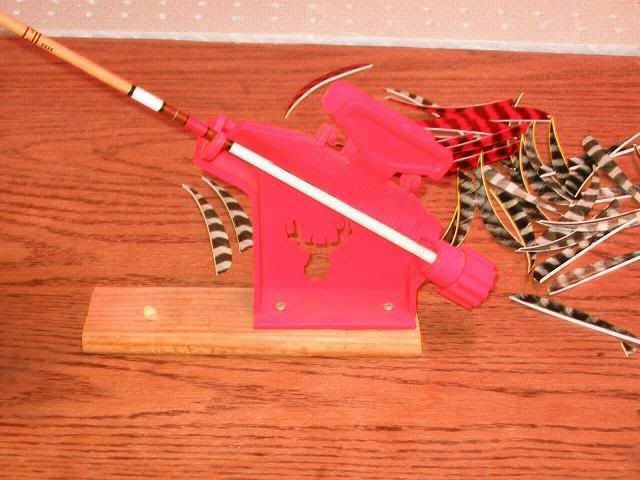 I have the first half dozen shafts fletched, I gave the bow a good rub down with OOOO steel wool to take off the shine and I made the rug rest and strike plate. For the strike plate, I used 2-3 Oz. 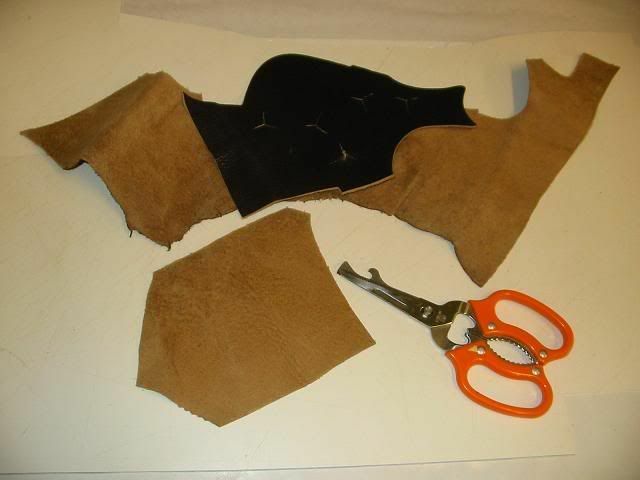 leather and for the rug, I used the fuzzy side of some adhesive backed Velcro strip I had laying around. The leather was from some scrap I had so I needed to add some double sided tape to make it stay on the riser. 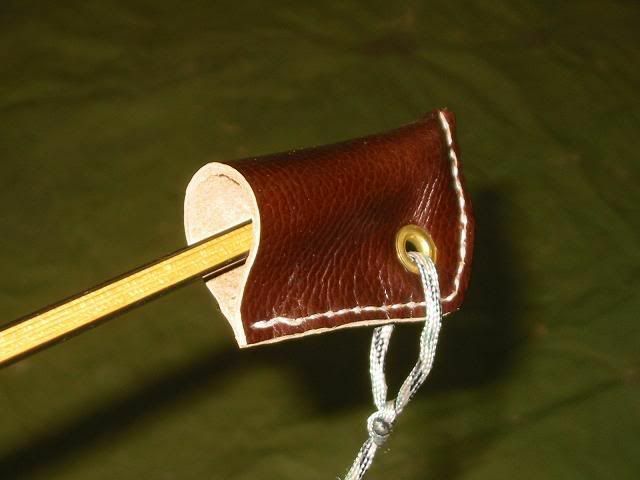 I then needed to add a leather grip to the longbow. 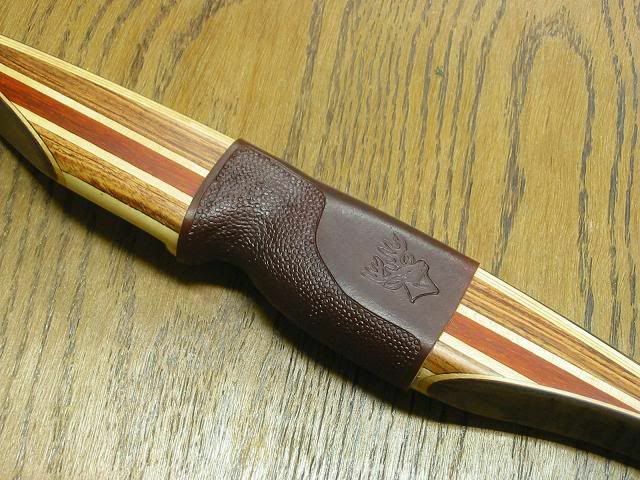 The finished wood was very slick and needed some texture. I started with a piece of 4 Oz. 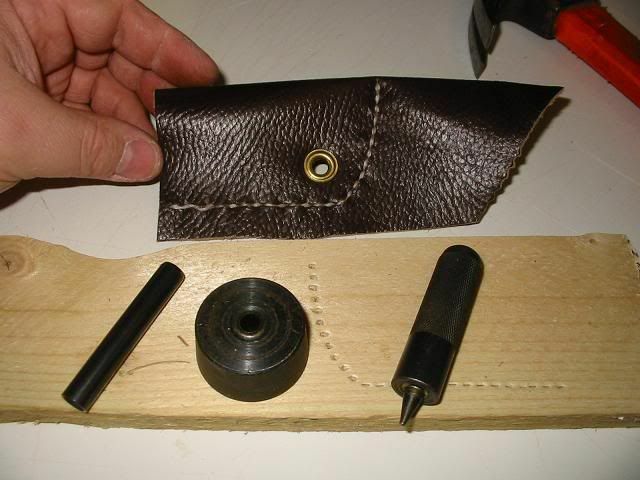 tooling leather and got it good and wet so I could form it to the shape of the grip. 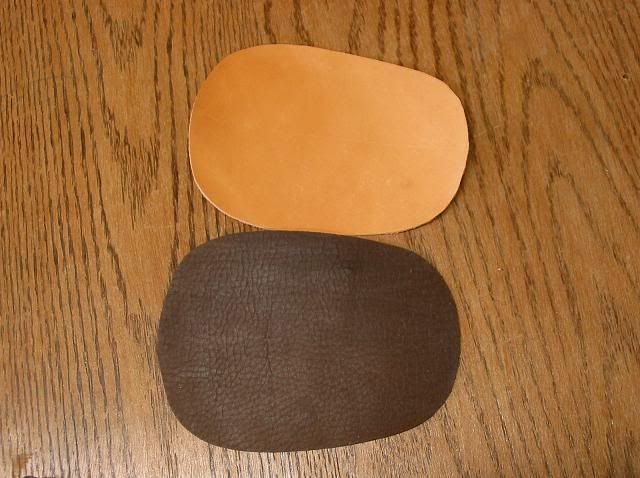 The wet leather is on the right. I gets much darker when you wet it. 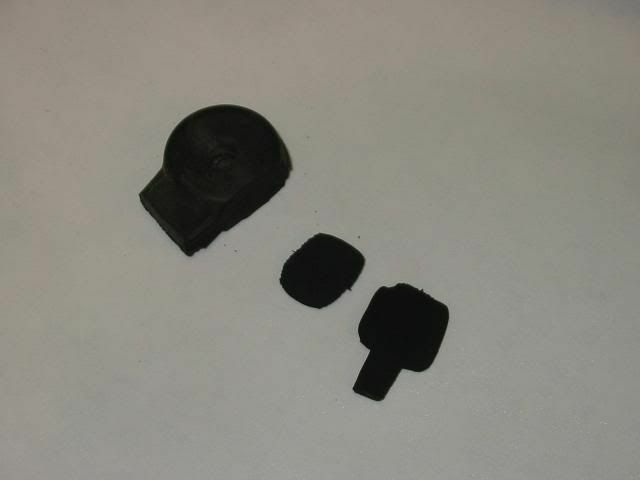 While it's wet, it can be formed and shaped and stretched to fit the contour of the riser. 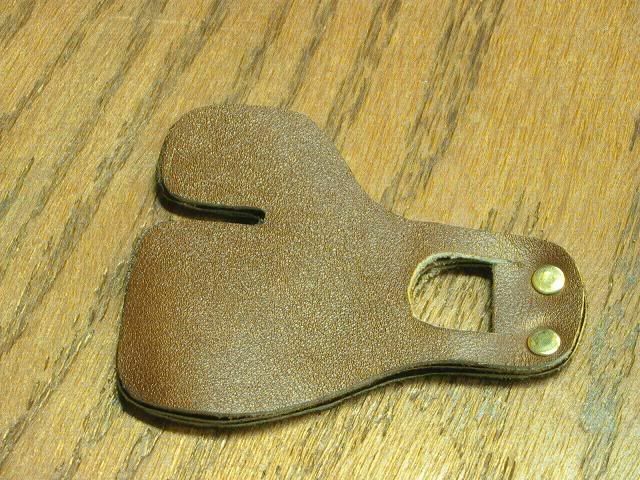 Once I had it shaped, I used a blow dryer to dry it off. So far during this build along, I have been pretty good about taking pictures of each step. Until now. 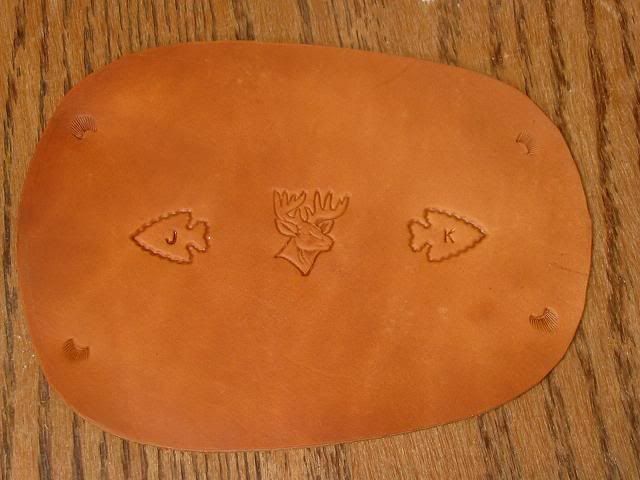 I must be getting tired because I did a bunch of stamping and tooling on the leather but forgot to get pictures of the process. 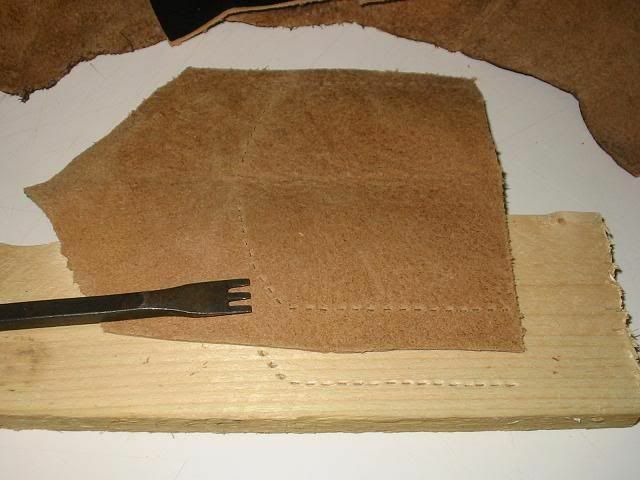 After stamping and cutting the leather to it's final size, I punched some lacing holes. 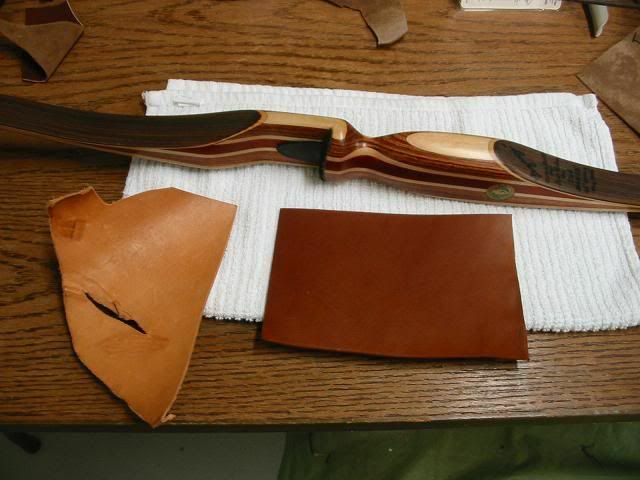 I then applied a coat of rubber cement to both the inside of the leather and the bow's riser. 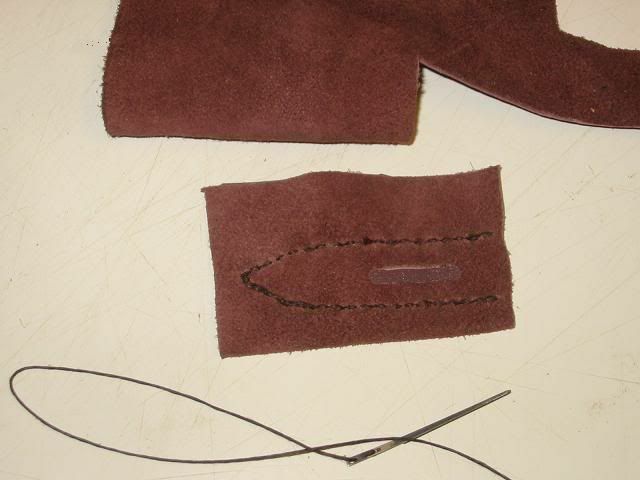 After lacing, I gave the leather a coat of Neats foot oil to restore the oils lost during the working of the leather and from blow drying. 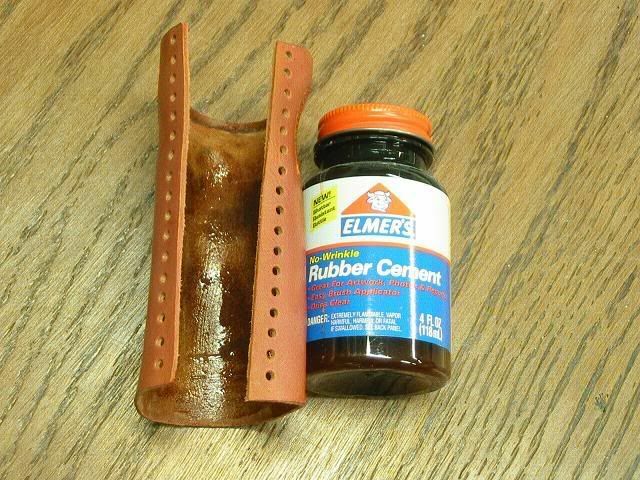 The oil makes the leather even darker. Now, you can see the tooling and stamping I forgot to take pictures of earlier. Then I took it outside for a picture in natural light. 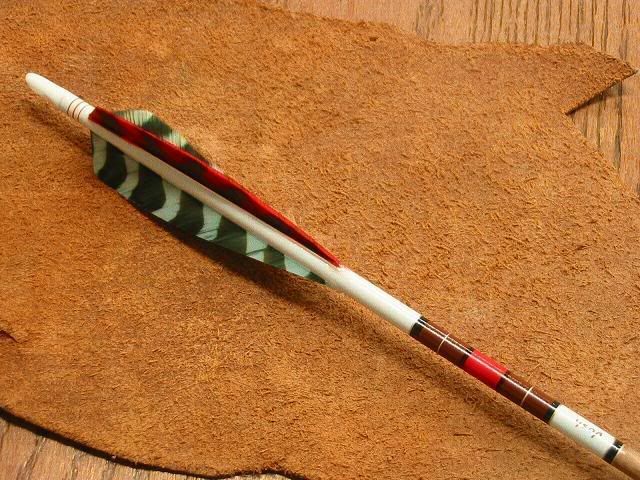 Well the bow project is finished with the exception of the quiver and and the fact that Josh wants to design and make his own broadheads. 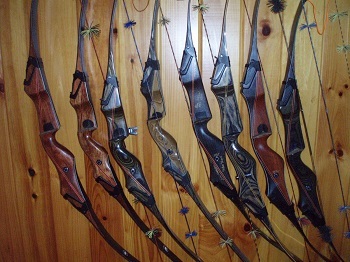 It was a fun project and I learned a lot of useful stuff for the next bow. And finally he got to shot if for the first time. 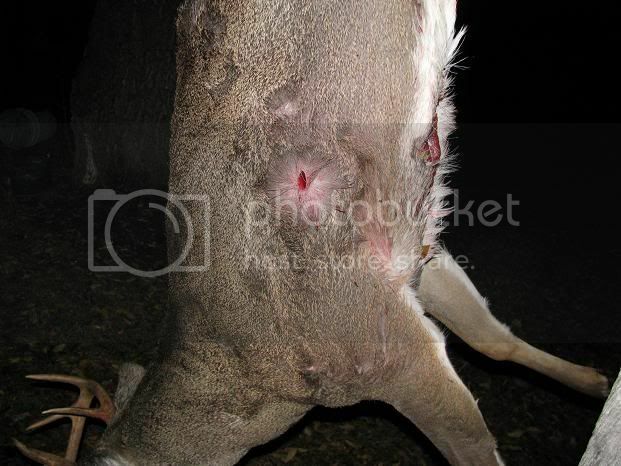 I then shot the bow through a chorongraph using a 125 grain field point. 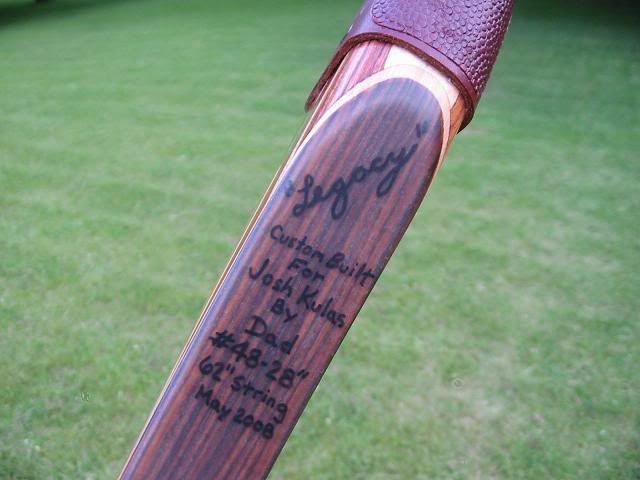 This brought the total arrow mass to 425 grains. The speed at 28 inches of draw was 174 FPS. This will produce 28.5 Foot pounds of K.E. giving him even more reason to keep any shots on game at less than 20 yards and broadside. 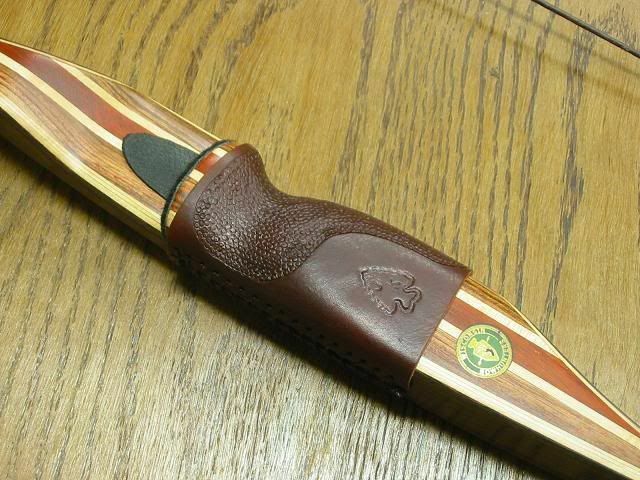 This will also be a design consideration when he starts to design the broadhead. All good lessons. 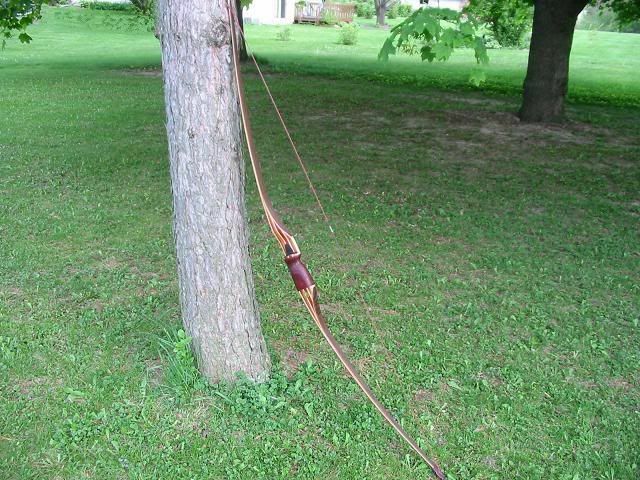 Now, as for naming the bow, We thought on it for some time and kept coming back to the first post where I explained the the bow was being made with a sort of legacy piece of wood. That name stuck. I explained to Josh that this bow is only to be handed down to one of his children. I hope I am around to see that. 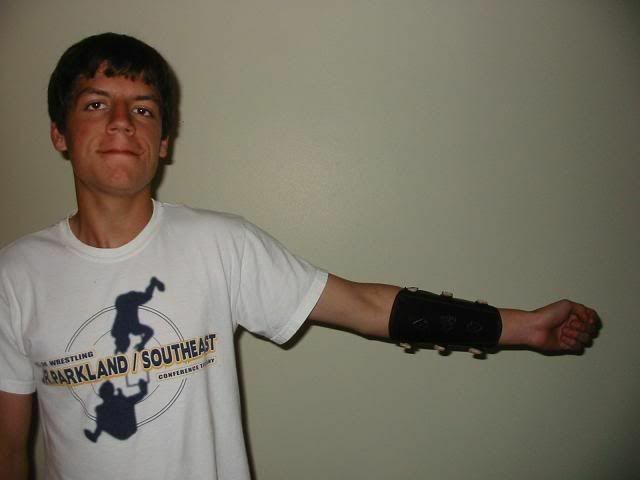 When I completed the project, I bought a new digital camera that will also shoot video so I used Josh as my Guinea Pig. I had him stand about 5 yards away because I was burning brush in our backyard fire pit and that was where we had to stand to stay out of the smoke. I told him to fire the 3 arrows and not to talk or look in the camera. His first shot was a dead center hit on the bullseye. The second shot cracked the nock of the first arrow and made it glance out. You can tell by the way he shakes his head that he wants to look at the camera and say something. 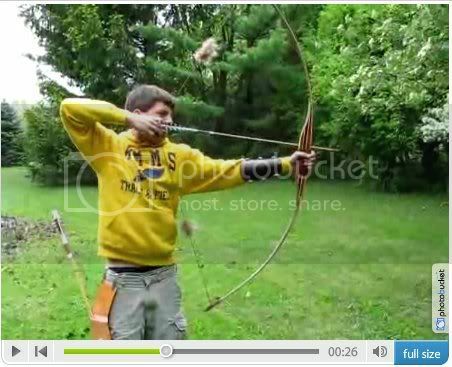 Here is my first ever video staring Josh and his homemade custom Longbow. I thought it only fitting to close this build along with the hunt story. Jush's fall sports schedule (cross Country and then Wresting) Kept him out of the woods so I asked him if I could use the bow. He said, yes. Here is the result. I moved one of my ladder stands and sat in it for the first time on a Saturday afternoon. I got to the stand at 2:30 pm and hung 4 small sponges soaked in Tinks 69 upwind of my location and then climbed into the stand. It was COLD with a slight rain snow mix and hard Northwest winds. The soggy river bottom and the rain made it almost impossible to hear anything approaching so I sat tight with my hood pulled up to keep me dry. At 3:30 I heard a noise to my left (down wind side) and turned to see a buck at 10 yards. He didn't smell me but I think he was focused on the Tinks sponges. I was busted sitting. 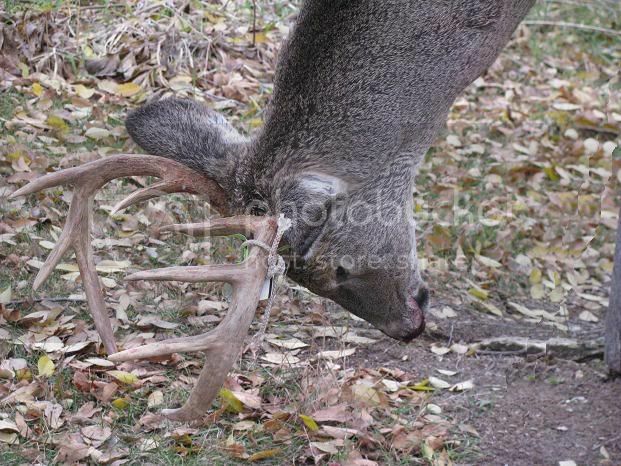 I have never harvested a deer from a seated position but there was no chance in standing up with the buck so close. He took a few more steps towards the sponges and stopped with his head and part of his front shoulder blocked by a big cedar tree. 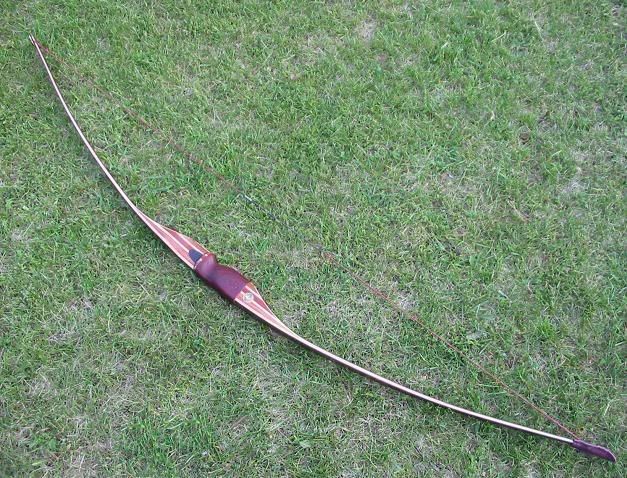 I took the longbow that was resting on my lap and moved it to the vertical position. and got ready for him to step forward but he just stood there. I leaned back and could see the hair line on the back edge of the front leg so I figured I would take the shot. I took the below picture the next morning to show where he was standing and made a poor attempt at sketching where he stood. I had plenty of time to tell myself to pick a spot and to take a good aim and then release. The arrow hit a bit high and the deer lurched forward and turned to run back on the trail he came from. About half of my 29 inch arrows was still visible as he ran off. I gave 3 loud blows on my grunt tube and he stopped for a moment and then walked off. I knew I had hit him high but I was not too far back so I was sure I had hit him in the lungs. I desided to sit for 20 minutes but waited 45 instead since he took off with my arrow. At 4:15 I got down and collected my sponges and went to where he stood to take up the trail. There was no blood to be found but the black muddy kicked up tracks made the trail easy to follow. 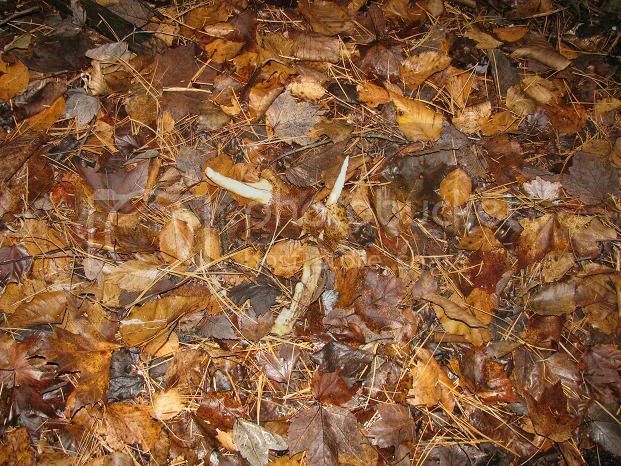 After tracking about 40 yards, I spotted a shed antler in the wet leaves. 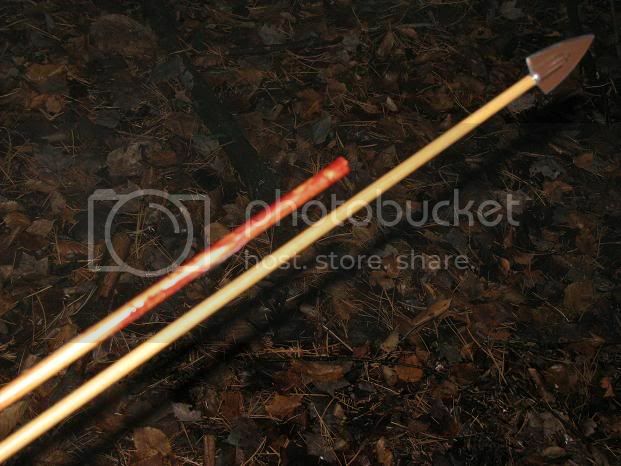 A few feet further I found my broken arrow. the first 6 inches were missing. The missing part included my homemade broadhead. 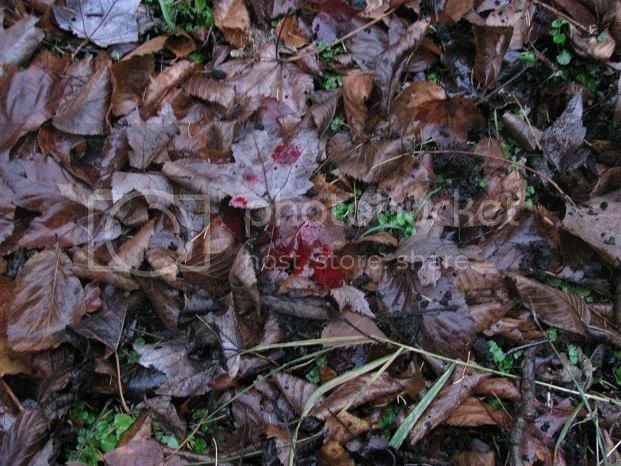 After going another 20 yards I found the only blood that I would find while tracking this deer. It was getting dark as I kept following the muddy trail along the river. It took me all the way to my other ladder stand so I desided to walk out to my truck to drop off the bow and quiver and take up a path that would lead me back to the stand but would parrallel the trail that I had just followed about 40 yards closer to the field edge. As I approached my truck, I jumped a deer and my heart sank. 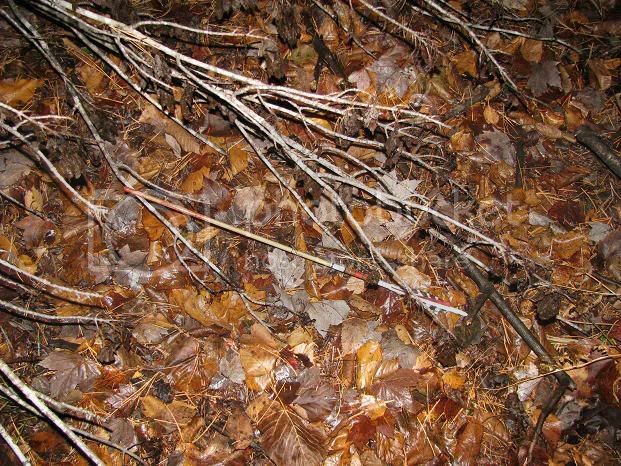 I never got a good look at the deer because it was too dark but I still took up the trail back to my stand and if I came up empty I would come back in the morning and take up the trail again. 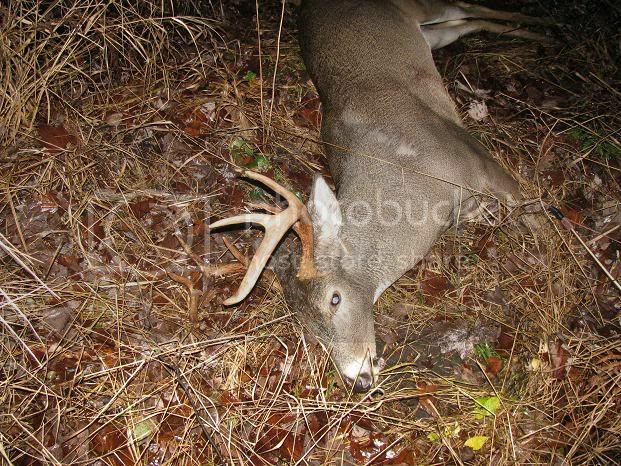 As I re-entered the river bottom to walk through the tall grass, I stumbled upon my buck. It was just dumb luck to walk into the woods where I did but I will take a bit of good fortune anywhere I can find it. 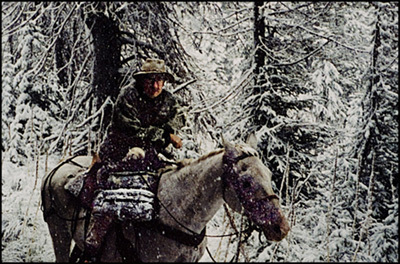 I learend the next morning that the trail I was following branched off and he died about 30 yards past the branch on the other trail. I looked him over and realized that he had died only a few yards from the spot my Uncle Stan used to hunt. Uncle Stan had died a few weeks earlier and when I put everything together in my mind, I just took a moment to sit in the grass and reflect on Uncle Stan and the fact that I had just realized my goal of harvesting a deer with all homemage gear and to do it in the same woods that Stan and I hunted so many years ago made it a pretty emotional event. Your never too old to shed a tear. I sat there pondering things and giving thanks for my good fortune. 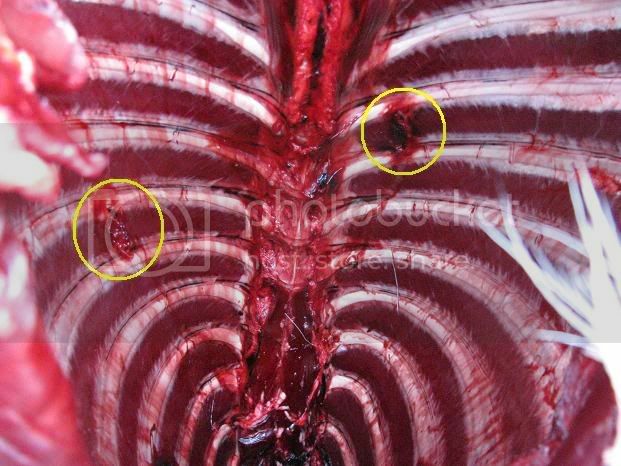 After gutting I examined the deer to find that I had gone through both sides even though the arrow stayed with the deer. 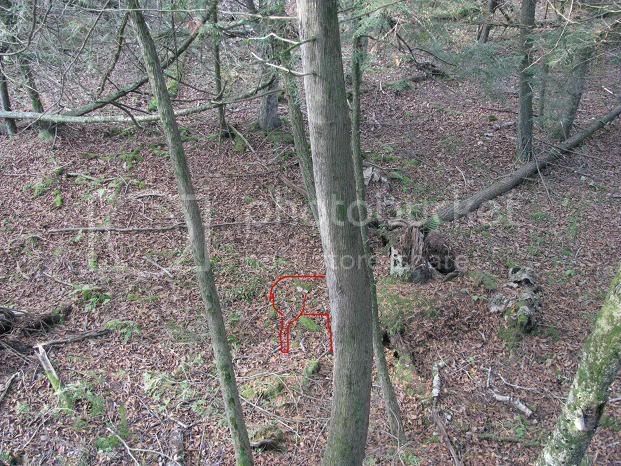 I expected to find the front half of the arrow and my homemade broadhead inside the deer but it no resides somewhere along the trail of his final steps. I had hit the top of the near lung and the upper third of the far side lung. He traveled less than 100 yards brfore it expired. 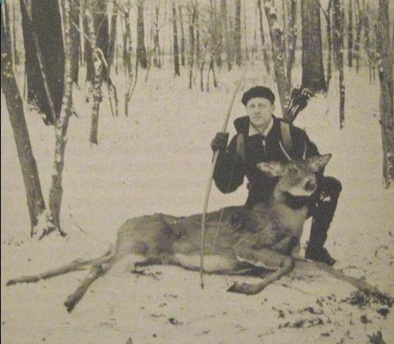 My goal was to partake in a hunt like the founder of the Wisconsin Bowhunters Association (Roy Case) did back in 1930. Roy was the first person in WI to harvest a deer with a bow during a recognized archery deer season. 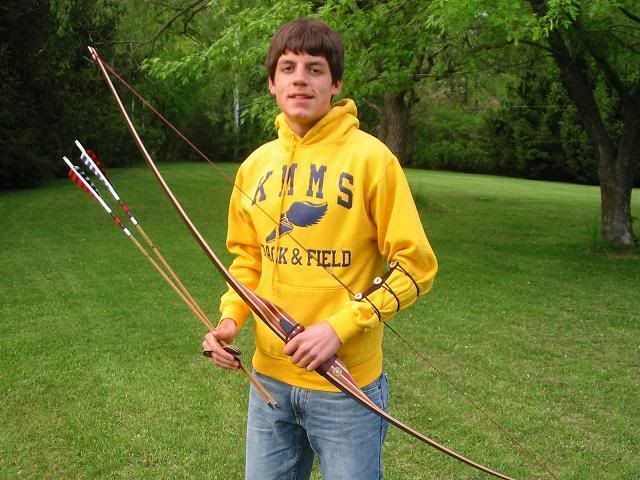 He did it with a homemade longbow and arrows and his own homemade broadheads. I couldn't be more pleased with my good fortune. My goal was to take a deer with a homemade gear and I was able to realize that goal in the same woods that I was brought up in. It doesn't get any better than this. I feel very fortunate to have achieved this goal. Thanks for tagging along. A great story and enjoyable read. Thanks for posting it. Stykshooter wrote: A great story and enjoyable read. Thanks for posting it. Yeah I'll second that.....thanks for posting, I enjoyed that!!!! 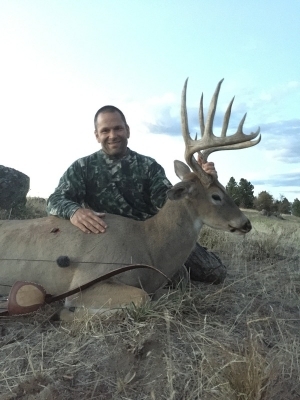 Great bow, great build along, and congrats to you on a fine buck! that leather grip is fantastic!